With as much paper as I’ve tried and touched, I can usually have an idea of how a notebook will perform almost as soon as I touch it. 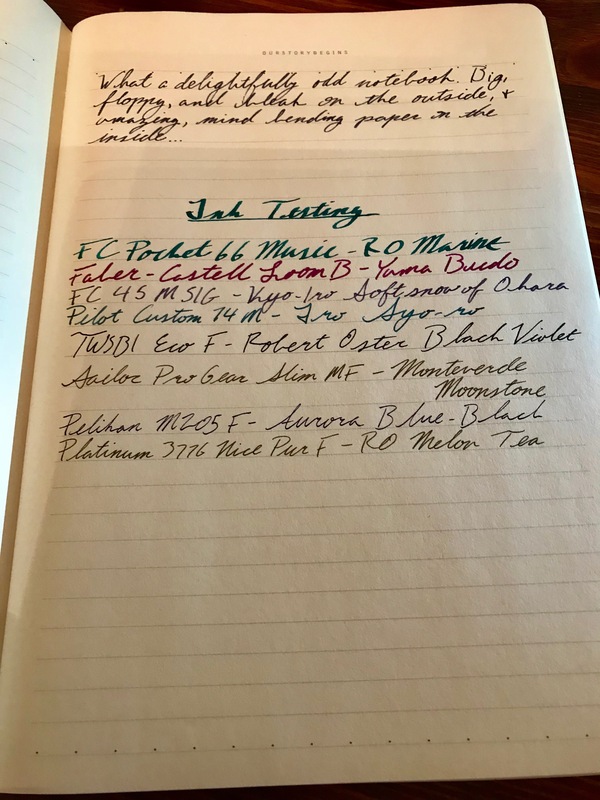 When you’re looking for a fountain pen friendly notebook, you’re usually looking for a tightly formulated paper, and the paper should feel smooth. If the texture feels loose or coarse, that usually leads to a more absorbent paper, which means feathering and bleed through. And even if it holds up to the feathering, you tend to lose any shading or character from an ink. With that in mind, imagine my surprise when I tried out my fountain pens and found both shading and sheen on a thin, loose paper. This Our Story Begins A4 notebook boggles the mind. I picked this notebook up from Pippi’s Pen Shoppe in York, PA on a whim, and I’m so glad that I did. Pippi had the notebook in a clearance pile, and I thought the cover looked neat, so I decided to give it a shot. The cover is striking. 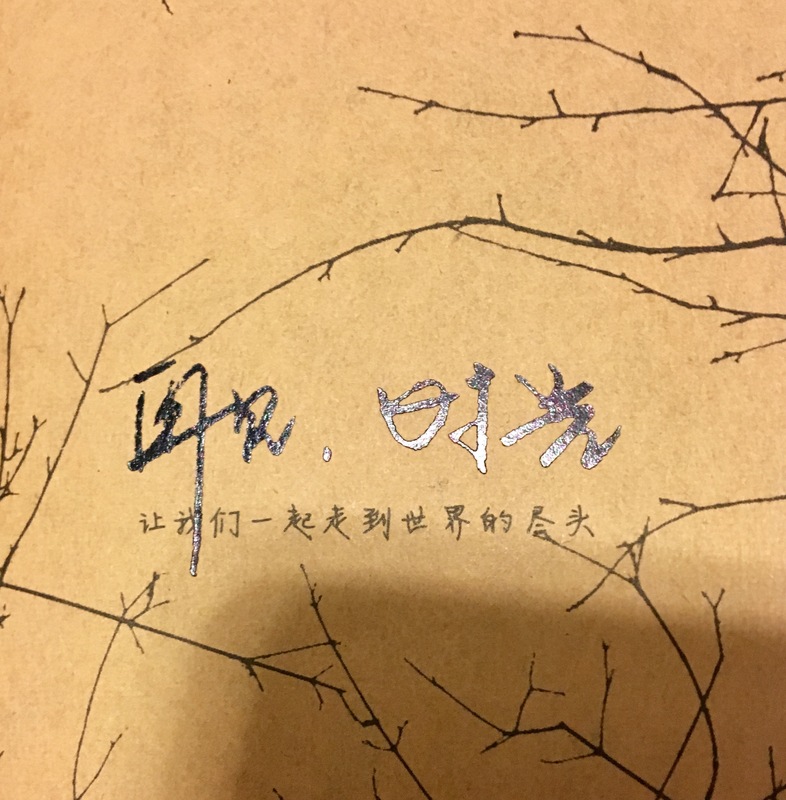 It’s a floppy, card stock cover with a bleak silhouette of branches and a bit of text. I had a hard time translating the characters, so I reached out to a few members of the Pen Addict Slack channel. Thanks to users rescuemonkey and hungrynerd, we came up with “good bye time. Let’s walk together to the end of the world” as one possible translation. At least the bleak saying matches the bleakness of the cover? The smaller characters are printed on the cover, but the larger characters are actually an embossed, glossy sparkle foil of some sort. And the embossing is so subdued that I didn’t even notice it until months after I had bought the notebook and finally started using it heavily. This was really hard to photograph, but it’s such a neat little feature! The notebook is a single 44 sheet signature, stitch bound right down the middle. Stitching is an interesting choice for a notebook of this size, but it helps the whole notebook lay nice and flat as soon as you open it. As a result, even the first page is easily usable, and you don’t have to break the spine or work it open to do so. The pages are lined, but lined in a peculiar way. 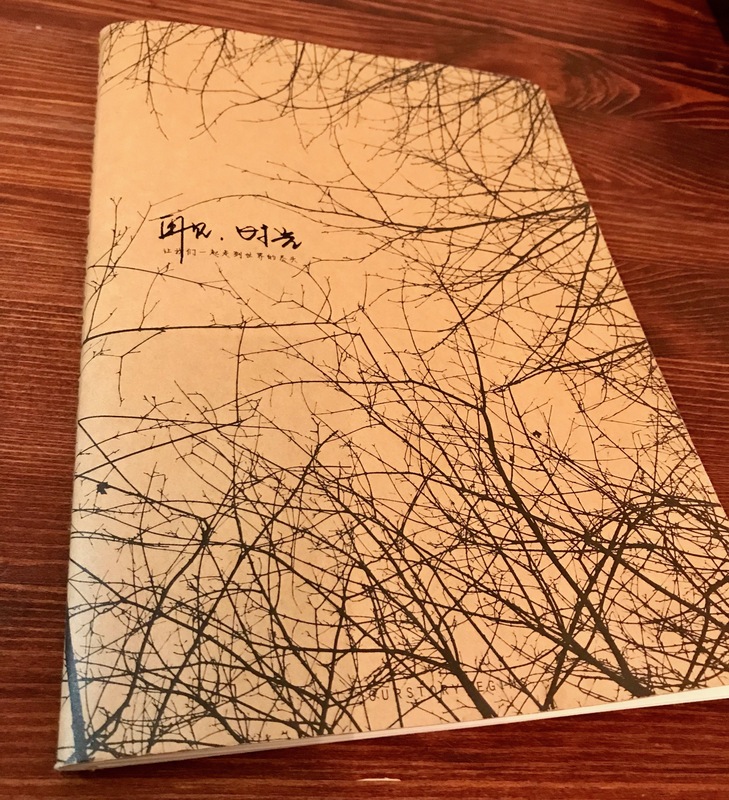 Each page has O U R S T O R Y B E G I N S printed at the top of the page, and the first and last lines have the divider dots that I’ve seen on paper from Kokuyo. Each of the lines on the page are actually lines of dots, except for the halfway line, which is a solid line. 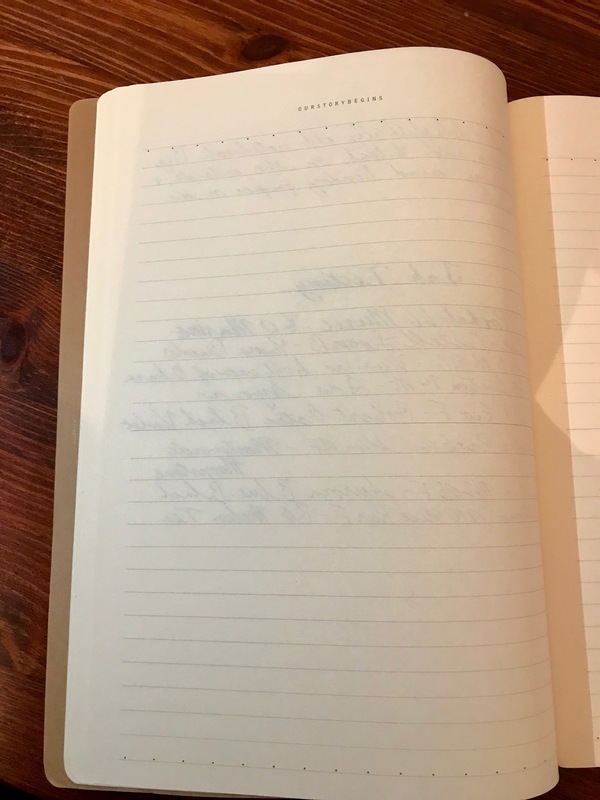 I’ve seen other notebooks highlight the middle line of the page, but thisnotebook’s line spacing changes around that halfway line, which makes the page look a little lopsided because it marks the halfway of the lined portion of the page, not of the whole page. It’s a really odd design choice, but I don’t find that it messes with the usage of the notebook in any particular way. Normally, about this time in a review, I’d try to tell you where to find one of these notebooks if you wanted to try one for yourself. But I can honestly say that I have no idea where to find these. While Our Story Begin’s website is printed on the back of the notebook, this notebook type isn’t listed under their product listing. If I try to search for it, the closest I get is finding their products on Alibaba, but not this notebook. When I bought this notebook from Pippi’s, I asked Pippi where she got it, and she mentioned that she had bought it from “some store in Las Vegas,” which doesn’t really help me track these down either. So I suppose I’ll just enjoy this one while I have it, knowing that it’s a bit of a rare oddity, and I’m ok with that.